After a painful setup, the P1 proves to be a deeply comprehensive and powerful controller for Cubase and Reason. Deep Cubase/Reason integration. High-resolution colour LCD. Great looks. Preset plugin/device parameter maps. Assignable QWERTY macros. 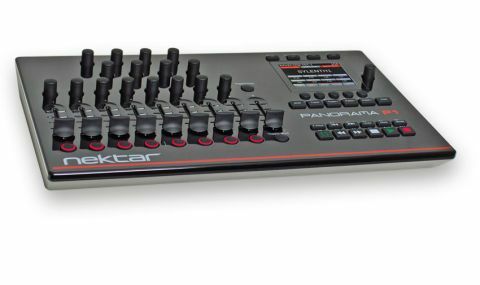 The Nektar Panorama P1 is a USB-powered control surface that comprises the centre section of their P4 and P6 keyboard controllers parcelled up into a smaller, more portable desktop device. Its launch coincided with the company also announcing the entire Panorama range's deep integration support for Steinberg's Cubase and Nuendo DAWs, in addition to the same level of integration with Propellerheads' Reason that the P4 and P6 have ably supported since their release in 2012. All P-series controllers can also be configured to work in standard MIDI mode - ie, transport control and MIDI CC assignable controllers and faders - with any other DAW or music program. "The illuminated buttons have a pleasant rubbery, tactile feel with a decent amount of travel"
The P1 is a good-looking thing, with its glossy, piano-black finish exuding an air of quality. After half a day's use, however, it'll show up every fingerprint and every particle of dust within a ten-metre radius, which is presumably why Nektar have included a microfibre cloth in the box. The illuminated buttons have a pleasant rubbery, tactile feel with a decent amount of travel, but while the encoders rotate smoothly, the fader caps on our review unit felt disappointingly plasticky and wobbly. Connection to a Mac or PC is simple - the only ports on the unit are a USB port and a 1/4" socket for a footswitch that can be assigned to control such functions as record in/out and preset switching. Setting up, on the other hand, turns out to be an arduous journey involving long lists of instructions, an account setup, product registration, two driver downloads and installs, one firmware update, and one DAW reconfiguration before you can even turn the unit on! So the P1 isn't exactly 'plug and play'. Once set up, though, the P1 starts to redeem itself enough to warrant any initial headscratching, thanks to its generous smattering of nine 45mm faders, 17 rotary encoders, 37 buttons and bright, clear 3.5" colour TFT screen. "Once you've got your head around the button combinations and screen modes, it starts to make a lot of sense"
The ultimate aim of the P1 is to provide a mouse-free workflow, and while you'll still need to turn back to your computer for screen-intensive tasks such as audio editing, once you've got your head around all the button combinations and screen modes, it starts to make a lot of sense - for mixing, at least. The layout of the functions accessible via the various soft keys is logical enough, and the ability to control virtual effects and instruments is achieved without the need for creating special 'wrapped' versions of your plugins as is required by Novation's Automap-enabled devices - we like that a lot. With its attractive looks and well thought out integration with two of the most popular DAWs out there, Nektar deserves huge success with the P1 once one or two kinks are ironed out of the setup process. However, if you're after a control surface for Reason and/or Cubase that really lets you get stuck into your DAW's inner workings, and you don't mind a bit of work in order to get it up and running, the P1 is already well worth a look.